1. I took this image of a friend of mine as I was teaching her how to breath fire for the first time. The image is a documentation of an invent and an achievement of an individual. The goal here is to preserve a memory. 2. The obvious answer here is that the relationship is one of friendship, but the emotions at the moment the image was shot lean more on the side of pride. A desire to show off what a friend can do and what I had taught her. The lack of flash leaves the subject to be eliminated by the warm glow of the fire casting her in an almost heroic light. 3. The image is a snap shot, a moment in time and as such is meant to be seen in the same light. It can be viewed by anyone and they would see the meaning behind it or by those who were there and who would attach a memory to the picture. Either way it is intended to be viewed fairly quickly. 1. This image was taken of a friend/coworker of mine and myself by an ex-girlfriend of mine, who was also an art major, on our last day in Columbus Ohio while I was touring. Our employes had taken us out to a local bar to say goodby. Here to there is an element of documentation but one holding a deeper personal meaning than the first image. The goal in this shot is to somehow hold on to a moment and a person the photographer is losing. 2. This image was shot during a time of happiness which concealed sadness. The image reflex these conflicting emotions. The colors are bright and vibrant which normally suggests happiness but they are also glaring and harsh. The woman in the background looks on with a sense of familiarity but also distance like she has been through the routine of making friends only to hold them at arms length knowing she will soon be leaving them. The man in the foreground is the main subject taking up a third of the image, yet the image was taken at a time when his back is turned from her and face is concealed, showing distance and separation. 3. This image hold emotion and as such one must take more time to examine what those emotions are. Its interned viewer are the subject and the photographer. 1. This is not your stereotypical war documentary photo. While most war documentary shots focus on the horrors of war here we see a human side which is normally overlooked. 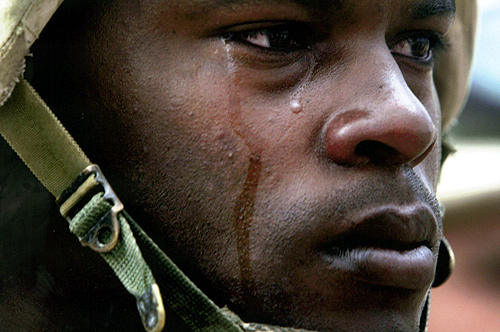 By focusing so closely on a soldiers face while he is crying the photographer forces the viewer to sympathize and empathize with the soldier. The objective of this photo is to show soldiers as people too, ones who are every bit as affected by the horrors of war as civilians. 2. Cynicism aside, it would be easy to say that the photographer felt a strong sense of sympathy and sorrow for the soldier. One might also read an urge to protect the soldier, perhaps this is why to image is cropped so tightly on the face in order to shield him from any bad connotation that many have with the sight of weapons or of military uniforms. By doing this he, once again, simply becomes a person. 3. An image as simple as this can easily be glanced over in passing but the intent behind it is that the viewer take the time to let the meaning soak in. for an image such as this to be effective it must be seen by as many people as possible.